You should be familiar with the usual fantasy RPG scenario. Heroes from all walks of life, from mighty barbarians to wizened sorcerers, storm the dungeons of evil lords, slay the monsters within, and loot the treasures they were guarding. It's a simple plot that has challenged and enthralled gamers for decades. However, Dungeon Keeper lets you experience the story from the other side of the coin. In this game, you are the dark lord. You are the ruler of the underground dungeon, the monsters are yours to command, and the treasures are yours to safeguard. You have to use cunning to turn your lair into a deadly maze of traps that no invader could possibly live through, populate it with a legion of fearsome monsters, and prepare for war against your fellow dark lords. There's so much wealth to be had in the world of Dungeon Keeper; only by abandoning your morals will you be able to take it all for yourself! No evil lord is complete if he doesn't have a lair to hold all of his stuff. Dungeon Keeper gives you unprecedented control over the appearance of your dungeon and how dangerous it will be to traverse. Design your dungeon in any way you see fit. Dig corridors through the stone, determine the size of the rooms, and set the layout to your wicked specifications. Give you dungeon a terrifying name. Excavate gold, gems and stone from the rock you dig through. Keep your Dungeon Heart safe above all else. As long as it beats, your dungeon will have life and power. Upgrade it to unlock new rooms, traps and minions. Maintain security over your dungeon. Rig a variety of deadly traps, blockade rooms and hallways using heavyset doors, and more. Raise chickens in the coops. Their succulent meat will keep you minions nourished and eager to fight. Build up your mana reserves in the Dark Library. Use it to unleash any number of powerful spells upon your enemies. A dark lord is nothing without an army of minions at his command. 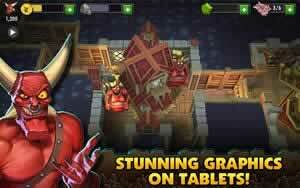 Dungeon Keeper will give you control over a variety of evil creatures. They will be charged with defending your territory or invading someone else's. They shall live, labor, fight and die by your orders. Don't waste them. Encourage your minions to work faster. A good smack is all the motivation they'll need. 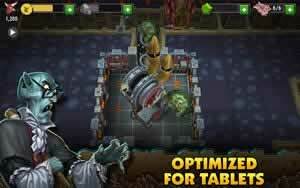 Use Imps to dig tunnels, construct chambers, mine gold, set traps, and defend the dungeon in a pinch. Summon Trolls to smash enemies into dust. Call upon hordes of Skeletons to swarm defenders en masse. Bring forth Warlocks to set your foes ablaze with fire. 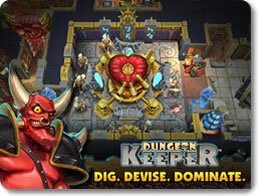 If you're sick of being the hero or the good architect, then Dungeon Keeper should be a breath of fresh air. You can build your own underground dungeon, design it in whatever way you like, populate it with your favorite minions, and expand your territory through force. When you've had your fill, you can then use your accumulated resources to attack other players' dungeons and pillage their goods for yourself. If that doesn't sound evil, then who knows what is? Come underground and build a fantasy dungeon of your very own that will spell doom for many foolish heroes in Dungeon Keeper.